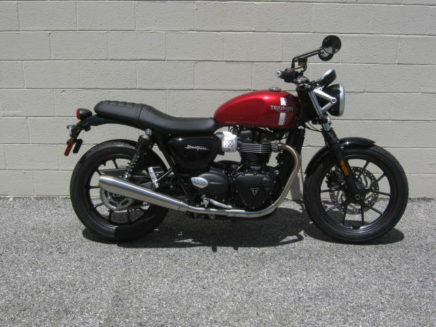 THE TRIUMPH STREET TWIN – THE “DO IT ALL WELL” MEMBER OF THE ELITE BONNEVILLE FAMILY. STRONG POWER, IDEAL HANDLING, PHENOMENAL GOOD LOOKS, AND AM EXHAUST NOTE THAT MAY BE ONE OF THE BEST STOCK SOUNDS IN ALL OF MOTORCYCLING! POUND FOR POUND, THIS BIKE IS AMAZING!! STOP IN AND CHECK IT OUT TODAY. 2016’s “Bike of The Year” award winner is back for 2018 and finally back in-stock as well! Why so many awards when the Street Twin launched last year? Simple! Because Triumph took everything that was great about their classic Bonneville line and then used that a springboard into modern day. Beautifully enhanced styling, distinctive exhaust sound, and a dynamic riding experience arguably make the new Street Twin THE best around-town bike ever made! Bold statement we know, but not if you can back it up. Stop in and check it out today. The new Street Twin packs the all-new 900c High-Torque, 8-valve, single overhead cam parallel twin engine into a all-new frame, along with ride-by-wire electronic control, ABS braking, and liquid cooling for enhanced responsiveness and amazing fuel economy – not to mention 18% more torque than prior Bonne’s. The Street Twin is all about riding feel and character. Read the reviews. Triumph not only did it right, “they nailed it” was how one prominent magazine put it. And we agree!